Born a slave on a Virginia plantation, Tom Molineaux (1784–1818) fought fellow slaves while plantation owners wagered on the contests. After winning one of these matches against a rival, Molineaux was granted his freedom and the sum of $500. By 1809, he had traveled to New York and subsequently to England where he pursued a title in London's boxing rings. Two notorious fights with English champion Tom Cribb in 1810 and 1811 won him a place in boxing history. Molineaux is considered the second notable American boxer, preceded by his Virginia-born trainer, Bill Richmond. 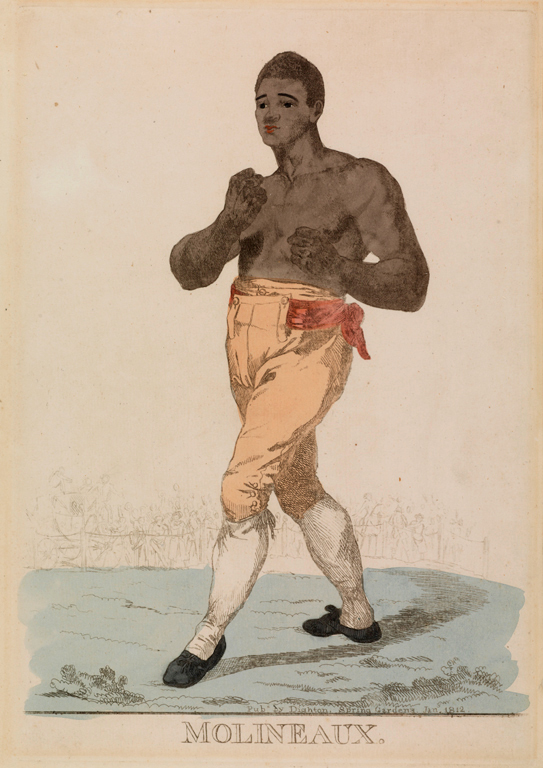 A hand-colored etching of Molineaux at an English boxing match (London, 1812) is now part of the VHS collection. This item was purchased with funds provided by the Carrie Wheeler Buck Fund.